Like Light on Dumyat, the first novel in Rennie McOwan’s series, The White Stag Adventure, re-issued by Rowan Tree in a new paperback edition in November 2017, is a thoroughgoing adventure story in the best tradition of Enid Blyton’s adventurous and resourceful Five and Seven, minus the very English middle-class notions and the lashings of ginger beer. Although it is not necessary to have read the first book fully to appreciate the second, there are echoes and memories which recall the previous adventure, given in brief detail, and which will encourage the reader to search for the beginning of the series. The novel opens dramatically, with a night-time deer-hunt which is interrupted by the appearance of a white stag, ‘looking […] like some gigantic beast from mythology, white and ghost-like’ (2), and then we quickly join Gavin, the pre-teen London boy, on his way to Faskally near Callander to stay at his Uncle Fergus and Aunt Elspeth’s farm, where he will join the Clan of Clare, Michael and Mot Stewart, whom he had met in the last novel. Last time, once Gavin had passed the initiation test, he had been allowed to become part of the Clan Alliance, under his mother’s name of MacRae. In the best traditions of classic adventure stories, his aunt and uncle are hands-off guardians, happy to send the children off to roam the hills and glens from dawn until dusk, trusting them to look after themselves, which they have already shown themselves well able to do. This time there is more opportunity to explore the wilder geography of the Scottish Highlands, rather than the gentler contours of the Ochils, and McOwan rejoices in the place-names and the landscape, unobtrusively or through Clare’s translating the Gaelic names. The plan for the summer is to make a den in the ruined castle on the island in the lochan, which is an opportunity for a description of building methods which could be used as a blueprint for any readers tempted to follow it. It is refreshing to read of a group of children excited to be in the wilds and actively creating their own space, rather than following the contemporary habit of ‘hanging out’ in a shopping centre or street corner. Unconventionally, Clare is the leader of the Clan, a very practical and knowledgeable girl about the same age as Gavin, well-versed in bushcraft and in the territory. An excellent leader and delegator, she teaches the three boys (and the reader) the lore of the hills, and the traditions of the Scottish clans. She is the researcher of the clans and their traditions, finding the information in books, rather than on the internet – there is never a mention of a mobile phone in these books – and Gavin has a notebook in which he writes down all the he learns for later study and revision. Although the viewpoint is mainly Gavin’s, the omniscient narration gives the reader the parts of the story which the children cannot know, so that the reader is ahead of events, which heightens the tension as the plot thickens. As is usually the case, the solving of the crime – in this case the poaching of a rare and valuable white stag – depends on one or other of the protagonists being in the right place at the right time to overhear critical conversations which advance the plot. In this case, however, the situations are set up precisely so that the conversations can be overheard, and if the adult reader cavils that the criminals are rather too overt in their explanations than would be realistic, the reader the book is designed for will not have such objections. The Clan Alliance find themselves obliged to break the rules they have promised to obey in order to save the white stag, but the moral compass is never in doubt – they will adhere to as many of the rules as they can. Finally, the forces of law and order prevail, and the poachers are captured, but not before a rather frightening turn of events where Clare and Gavin are in real danger. The white stag, however, makes its own salvation without human help, swimming from its sanctuary on the island to the shores of the corrie which is its natural habitat. This book has very high production values. A solid sewn binding holds a substantial weight of page, and the Bembo font is very clear, and easily read. Although there are no illustrations in this edition, as there were in previous versions, this is no lack, as the writing is so evocative that the reader creates his/her own mental images. Very highly recommended, and I am looking forward to reading the next two novels in the series. 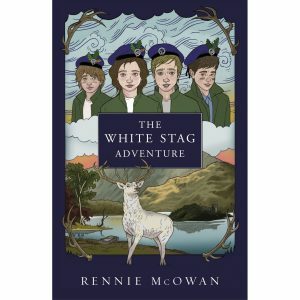 The White Stag Adventure by Rennie McOwan is published by Rowan Tree Publishing, 2017. Morna Fleming is a member of the Education Committee of the Association for Scottish Literary Studies and co-editor of the soon-to-be published Voices of Scotland, an anthology of Scottish poetry with teaching suggestions for Curriculum of Excellence Levels 2 and 3.